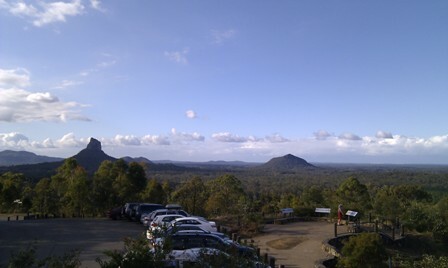 I finally got my Toyota Prado off road in the Glasshouse Mountains National Park and the D’Aguilar National Park. The D’Aguilar National Park was easy driving. I had the car in HL most of the time, except for a couple of steep decents where I used LL. We did not venture off the beaten track, but I am sure there were some more challenging tracks to be found. We ventured to the Glasshouse Mountains National Park the following day, trying to follow one of the touring trails from the Dirty Weekends book. Unfortunately, the track we were trying to follow had been closed since the book was published. We were left with the choice of retracing our tracks, or trying to find our way without detailed maps or a guide. We took our chances on trying to navigate our way out. I was quite surprised to see another Prado covering the same terrain with the standard Goodyear AT20 Grandtrek tyres. Either the driver had better skills than me, or he simply had no idea how close he was at times to getting stuck. After venturing down some true four wheel drive tracks, we finally decided the track was getting too narrow and beyond my experience. Without a second vehicle to pull me out should I get stuck, I decided to retrace our route and return home. I strongly recommend getting a detailed map of the area’s tracks. I found that the Prado’s clearance was limited a couple of times, scraping the tow bar and under body in ramp-over situations. Overall though, the Prado was very forgiving and let us have a bit of fun offroad without my inexperience getting us in trouble. There were some highly modified four wheel drives around the tracks, and some lads giving them serious workouts on side tracks. All a bit of dirty good fun! The Glasshouse Mountains National Park is very picturesque, but you can reach the lookout it with a standard two wheel drive vehicle.